Searching for promising nontoxic and air-stable perovskite absorbers for solar cell applications has drawn extensive attention. 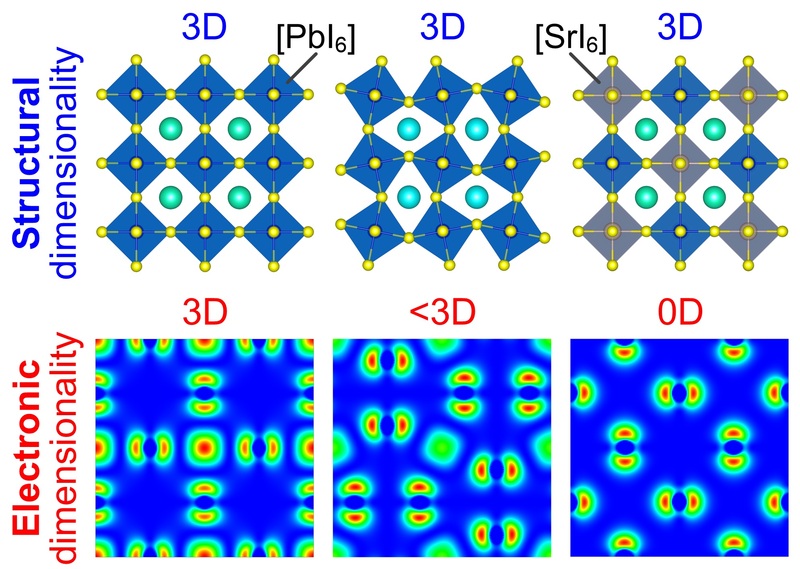 Here, we show that a promising perovskite absorber should exhibit a high electronic dimensionality. Semiconductors that exhibit a high structural dimensionality, but a low electronic dimensionality have less ptomise as an absorber, because of barriers to isotropic current flow, enhanced electron/hole effective masses and fundamentally deeper defect states (more effective at causing recombination). Our concept accounts for the device performance of the perovskite-based solar cells reported in literature so far. 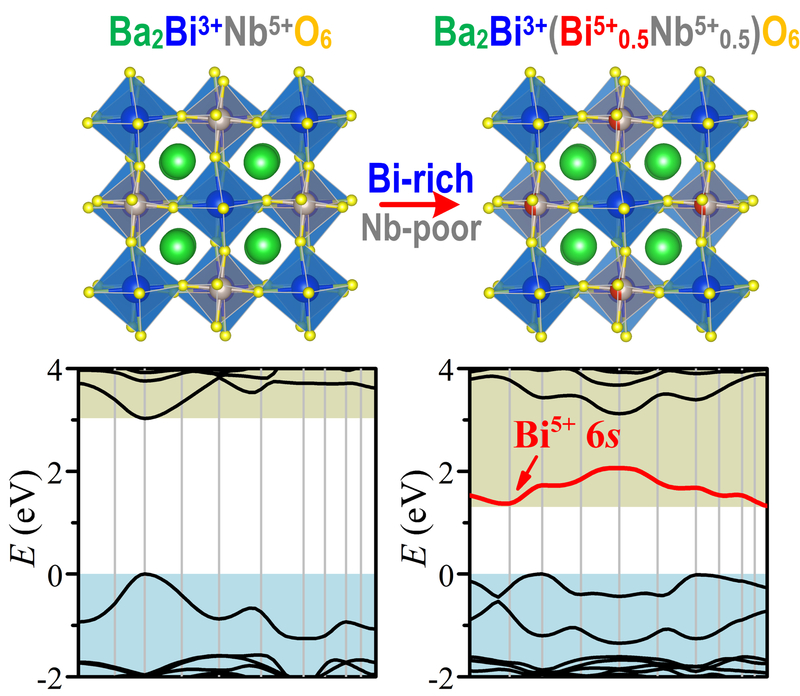 Density-functional theory (DFT) calculation reveals that the bandgap of barium bismuth niobate (Ba2BiNbO6) double perovskite oxide can be effectively narrowed if the oxide is made Bi-rich and Nb-poor. Materials synthesis and characterization confirm the predictions from DFT calculation. The results suggest a new strategy for bandgap engineering of metal oxides toward active photoanodes for efficient solar-driven water splitting. Thn-film Cu(In,Ga)Se2 and CdTe solar cells have demonstrated high power conversion efficiencies, but they cannot provide a sustainable clean energy pathway due to the scarcity of Te and In. 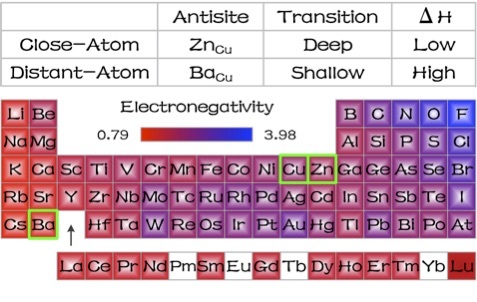 Here, we propose a distant-atom concept to mutate In by a group-II element (Ba) and a group-IV element (Sn) that are at rather different locations on the periodic table. Due to the very different electronic properties between the cations, the resultant earth-abundant orthorhombic Cu2BaSnSe4 absorber does not have the detrimental cation-cation disorder issue seen in earth-abundant kesterite Cu2ZnSnSe4 absorber. We anticipate that Cu2BaSnSe4 solar cells should not have large open-circuit voltage deficits as seen in Cu2ZnSnSe4 solar cells. Density-functional theory calculation on the electronic and defect properties of Cu2BaSnSe4 confirms these expectations. Producing clean and low-cost hydrogen fuels via solar-driven water splitting requires efficient oxygen evolution reaction (OER) catalysts. The current most efficient OER catalysts in acidic or alkaline solutions are IrO2 and RuO2, which suffer from the scarcity and high cost of noble metals. 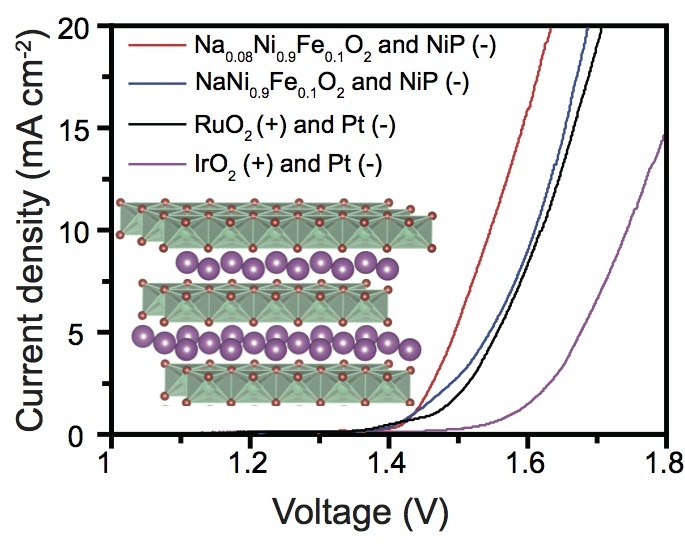 Here, we demonstrate that layered Na1-xNiyFe1-yO2 double oxide electrocatalysts exhibit OER activity and stability superior to the state-of-the-art noble metal-based oxide and FeNi layered double hydroxide catalysts. 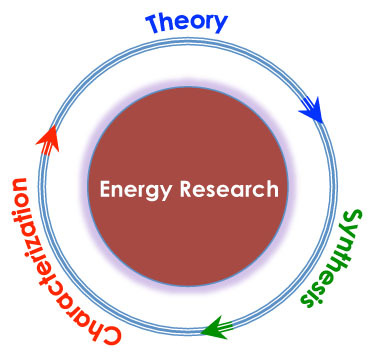 The strategy for enhancing the OER activity of transition metal oxides and approach for synthesizing layered provide insights for exploiting highly efficient noble metal-free electrocatalysts for water splitting and metal-air batteries.